http://www.attractionchecklist.com – ATTRACTION DOUBLE HEADER! Join Grant and John as they brave the Silly Symphony Swings and Jumping’ Jellyfish at Disney California Adventure! Ride Audio Recorded on June 21, 2016. This episode we are heading to Disney California Adventure for our first ever attraction double header as we ride two attractions in one episode! First we’ll attend a wild band concert on the Silly Symphony Swings. Located in the Paradise Pier section of the park, the Silly Symphony Swings are described in the guide in the following manner: Enjoy boardwalk fun at its swinging best. The Thrill level describes the attraction accurately as a spinning ride and it does have a height requirement in that guests need to be 40” or taller to ride. After the Silly Symphony Swings, we’re going to head over to the Jumping’ Jellyfish attraction. Also located in Paradise Pier, this ride is described in the guide map in this way: Drop down through a colorful forest of kelp. The thrill level warns that this attraction features Small Drops and it also has the 40” or taller height requirement on it. 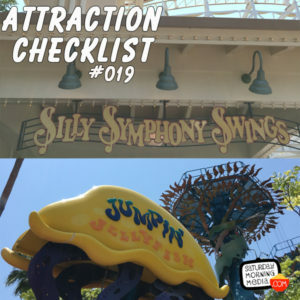 Before our feet leave the ground for these two attractions, here are five fast facts about the Silly Symphony Swings and Jumping Jellyfish. 1. Jumping’ Jellyfish is a California Adventure opening day attraction, beginning operation on February 8, 2001. Silly Symphony Swings officially opened on June 11, 2010, but it replaced a similar attraction called the Orange Stinger which was basically the same ride but enclosed in a giant orange. 2. Silly Symphony Sings is themes to the 1935 cartoon, The Band Concert where Mickey conducts an orchestra during the middle of tornado. When the ride opened in 2010, it coincided with the 75th anniversary of the cartoon! 3. The mild Jumping’ Jellyfish attraction at California Adventure has a sister attraction, also named Jumping’ Jellyfish, at Tokyo DisneySea in Japan. The version at Tokyo DisneySea opened a few month after it’s California counterpart on September 4, 2001. 5. Though they do so in much different ways, both attractions lift riders 40 feet off the ground and both have a ride time of generally about a minute and thirty seconds. With me today for this special double header is my friend John B. deHaas and after we ride we’ll discuss our thoughts on this classic Disneyland attraction. If you have headphones, put them on now as this trip is a binaural recording. And now let’s ride Silly Symphony Swings and Jumping’ Jellyfish at Disney California adventure.